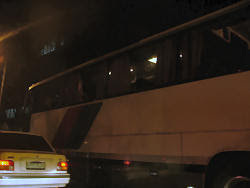 The last bus I rode was a Victory Liner bus headed to Baguio. I wasn't able to try their deluxe buses which I heard has a restroom inside... but that's okey. I've seen a double decker bus a couple of months ago parked at the World Trade Center. I never experienced riding one too. If I would, I'm taking the upper deck. Buses with TV's and DVD players are common as well. One bus I saw had 2 TV's, with the 2nd one suspended halfway from the entrance for those at the back. But the one that topped it all off and a first for me to see was this luxury bus parked near Meralco Avenue in Pasig City. Looking through the bus window from outside, the bus seemed to emit some bright yellowish lights from inside. 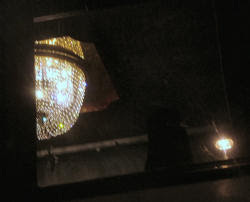 After staring at it for a few more seconds, I realized that this bus had a chandelier ! It was around 1.5 feet high suspended on the aisle part of the bus. Now that's classy !